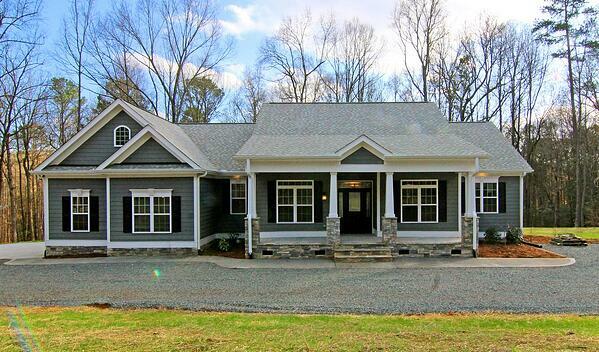 The Westchester Farmhouse has exterior elements of craftsman home design - and interior modern farmhouse finishes. Take a look inside. 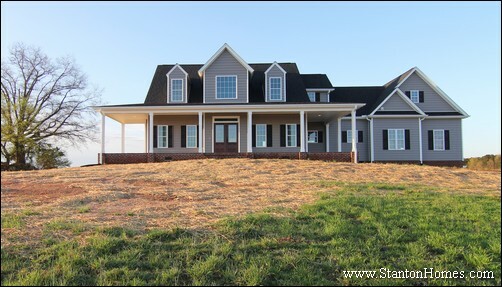 This Farmhouse design is 2,590 sq ft with 3 bedrooms, 3 bathrooms and an open layout for the island kitchen and great room. 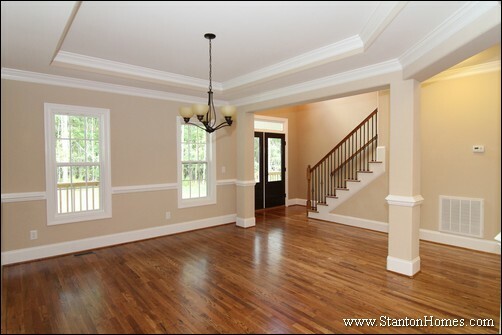 Contact us for more details about this home - and for information on building your new home in central North Carolina. 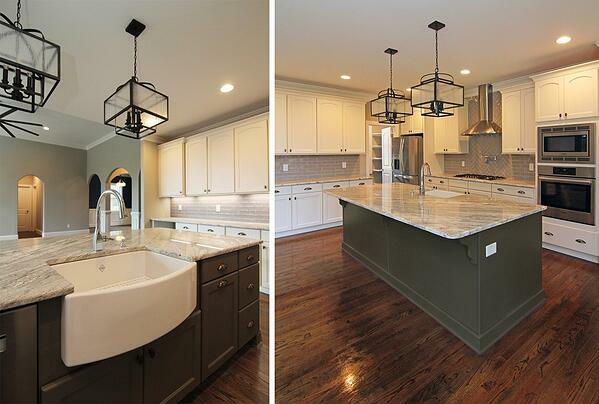 The two tone kitchen - with white perimeter cabinets and a gray island - features a white farmhouse sink, black pendant lights, stainless steel appliances, pot filler above the gas range, and many more unique custom home features. 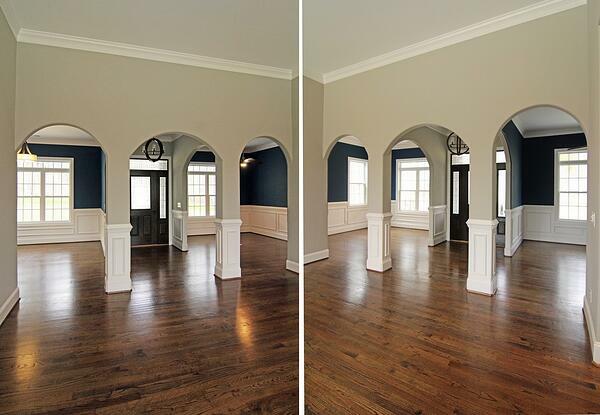 The foyer entry opens in all directions with archways. Flex rooms on each side serve as two home offices, or a dining room and formal living room. The walls are painted blue, with white wainscoting. 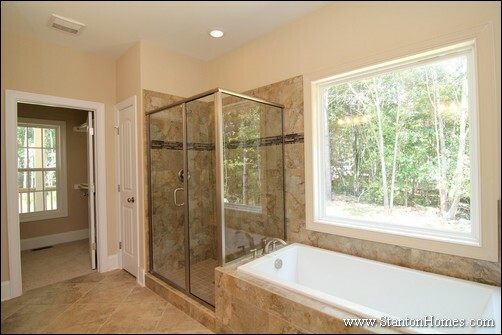 The master bathroom features an open shower with no door, custom tile patterns, rain shower head. 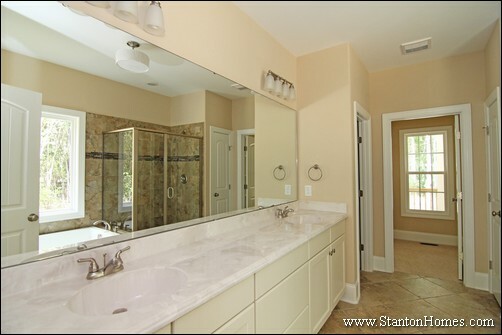 The vanity has undermount square sinks, dark framed mirrors, and bump-out center drawers. Which of these two farmhouses fits your personality best? These Raleigh homes are built from the same Max Fulbright floor plan, called the Low Country Farmhouse. Compare the selections side-by-side (paint colors, light fixtures, granite counter tops, cabinets, kitchen layouts, and everything else inside and out!) to find which farmhouse design you would build! The farmhouse master bathroom has a linear footprint with a shared his and her vanity along one wall and tub/shower along the opposite wall. The first farmhouse bath connects the tub surround and shower, leaving space for a shared bench inside the shower. Note the tub faucet on the side of the tub. The tub in the second farmhouse bath is a touch larger. 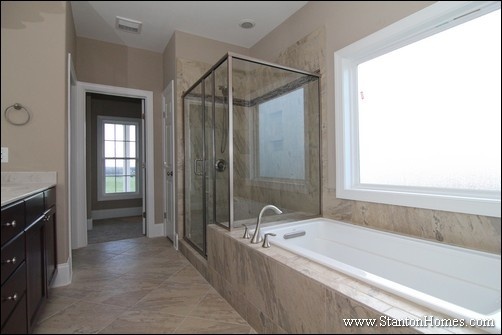 There is no bench in the shower, leaving space for the tub faucet on the shower side. What type of windows do you want in your master bedroom? How about a trey ceiiling? These windows are tall, extending almost to floor level. 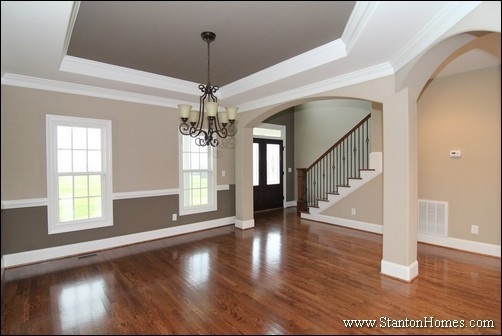 The trey ceiling is a simple design, with white crown molding. 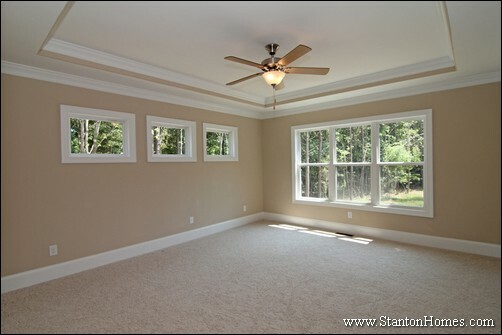 Compare these master bedroom trey ceilings - this one has a ribbon accent (Sherwin Williams 6106 KILIM BEIGE paint). Three windows are raised in this bedroom, for a square craftsman look that leaves space for the bedroom furniture below. 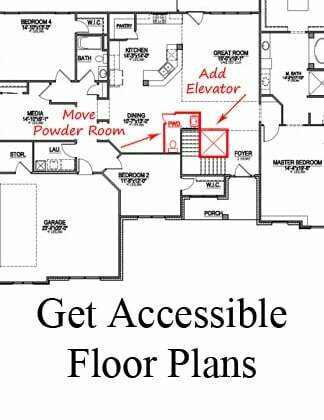 How big is a walk in closet? 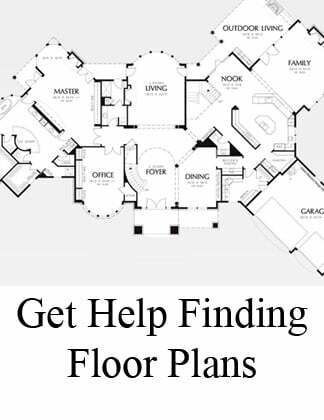 What types of storage are most important in a master closet? The first farmhouse includes built in shelving in a wall that divides the his and her closet space. 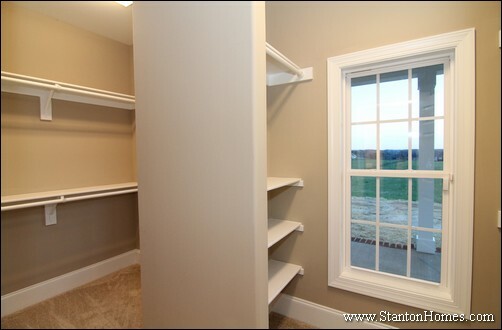 The farmhouse plan includes TWO windows in the master closet. 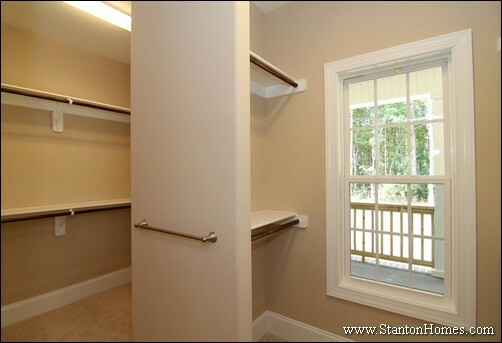 Instead of extra shelves, the second farmhouse includes a second hanging rod for short clothing and a towel rack - for storing your shower towl in the dressing area of this huge walk in closet layout. 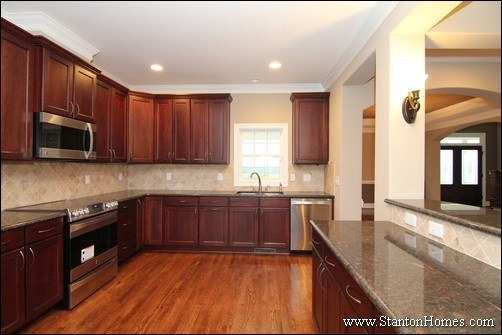 Do you want a large laundry room with folding counter top? Or a mudroom style laundry with built in sink, expanded counter top, and extra storage cabinets? Miss the first two parts to this Raleigh farmhouse story? Which of these two farmhouses fits your personality best? 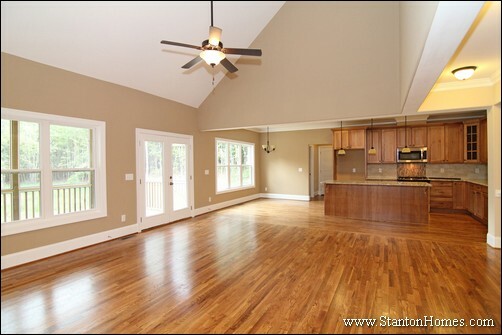 These Raleigh homes are built from the same Alan Mascord floor plan, called the Low Country Farmhouse. Compare the selections side-by-side (paint colors, light fixtures, granite counter tops, cabinets, kitchen layouts, and everything else inside and out!) to find which farmhouse design you would build! 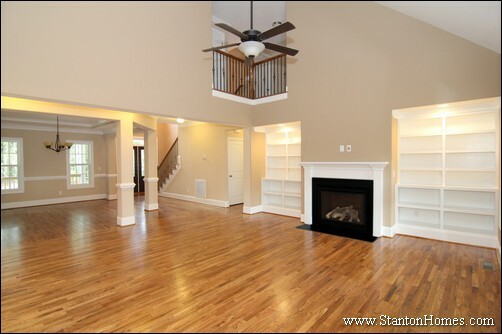 What's your favorite kind of storage, open shelves, bookcases, cabinets, or all three? The first farmhouse continues the accent paint into the open shelving, for an upscale design/build look. 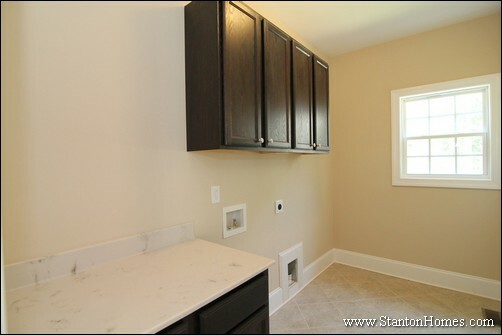 The fireplace has a black slate surround with custom site-built wood mantel, painted white. The second farmhouse also has a black slate surround with custom site-built wood mantel, painted white. The open bookcases in this great room are more subtle, with a two-step layout. Two French doors lead to the backyard concrete patio with roof. 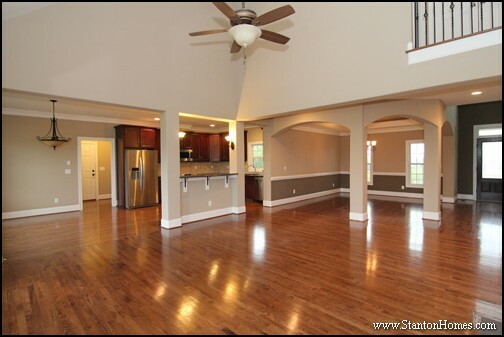 The great room, kitchen, and breakfast are open (with a column added to the breakfast room to mirror the kitchen island design). These double French doors lead to a backyard screen porch. 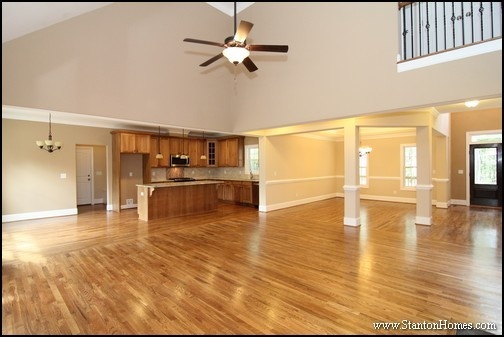 The open kitchen / great room / breakfast room keep an airy flow. 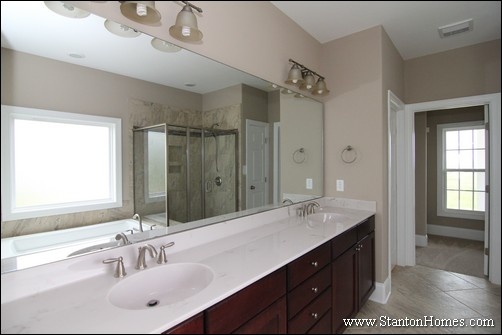 What color counter top is best in the bathroom? 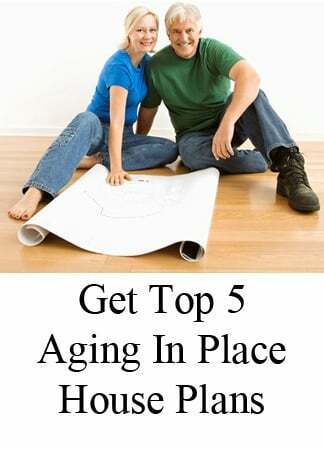 How many windows should be in your master bedroom? What is a trey ceiling? How large should my walk in closet be? 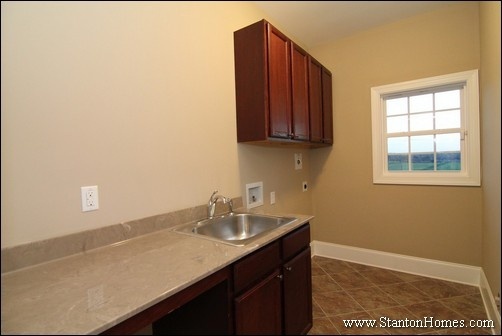 Sink or no sink in the laundry room? Which of these two farmhouses fits your personality best? These Raleigh homes are built from the same Max Fulbright floor plan, called the Low Country Farmhouse. Compare the selections side-by-side (paint colors, light fixtures, granite counter tops, cabinets, kitchen layouts, and everything else inside and out!) to find which farmhouse design you would build! 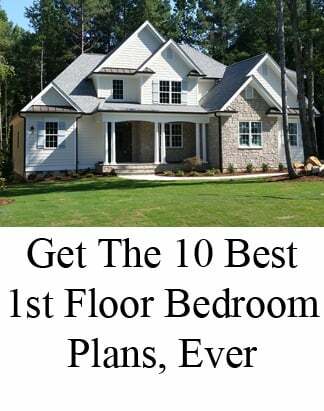 These farmhouse homes are great examples of how a design/build homebuilder works to integrate every element you're looking for in a new home for your family. Starting with the exterior, see which farmhouse you love most - and then tell us why! 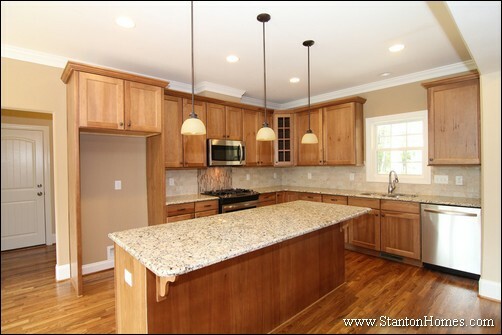 We'll tell you exactly what paint colors, granite countertops, light fixtures, and cabinet styles are used in each - so you can see how Stanton Homes builds "real homes for real people" with their budget and wish list in harmony. 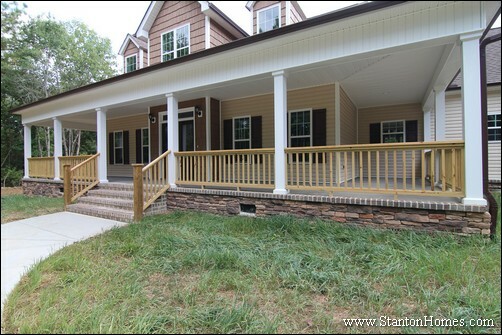 Farmhouse designs will have large front porches that often wrap around at least two sides of the home. The Low Country Farmhouse front porch wraps on three sides. 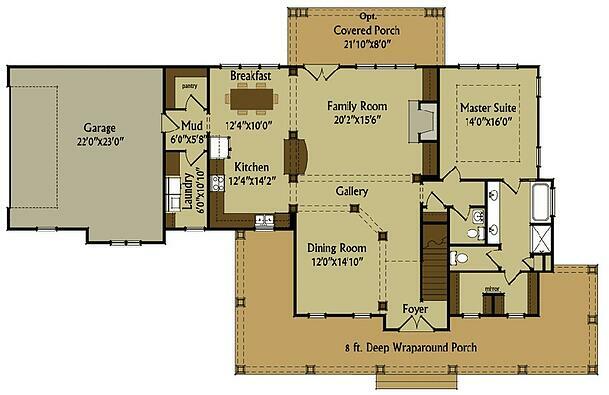 In the first farmhouse, the kitchen preserves the original layout in the floor plan (included below). 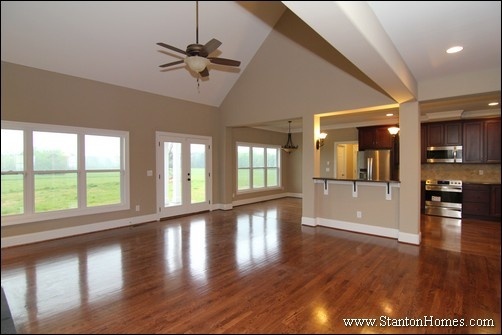 The second farmhouse kitchen eliminates the columns and raised eating bar. The island is also larger. 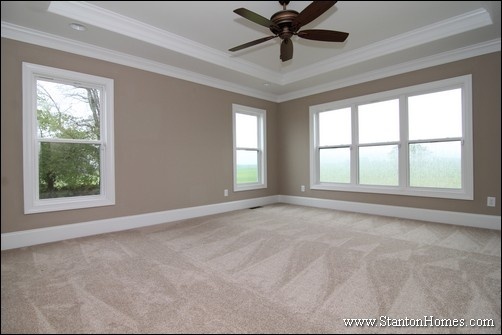 What type of built ins are best for my family, in central areas like the living room? What details are important in my formal dining room? 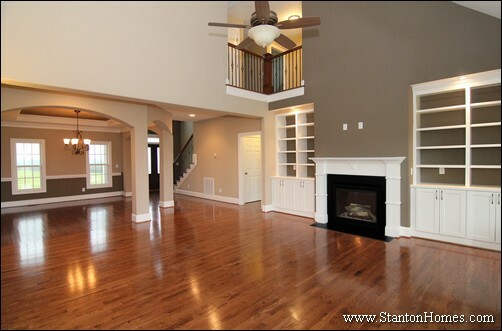 Do I like two story foyers?